Wow, I feel like I've written about this so many times. NJ 19 and NJ 120 were both supposed to be NJ 20... if you connect the north ends of 20 and 19, and the north end of 120 to the south end of 20, you have the routing the route was supposed to take. 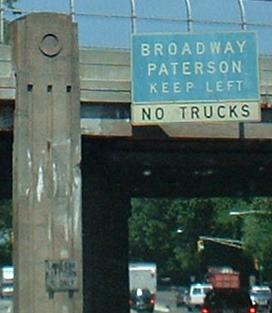 The concept of connecting 19 and 20 via a western Paterson freeway battled for more than twenty years, but died in the mid-'80's. 120 took a couple years more than that before NJ finally abandoned the concept of tying it in. The roads are pretty much all there, but 120 and 20 are both expressways, and the connecting framework isn't up to that standard. 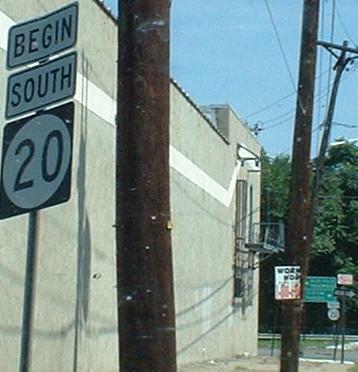 So now, NJ 20 is picturesque McLean Boulevard. Looking SB at the last assembly on NJ 20. 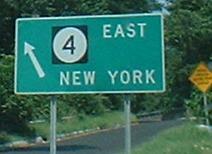 The ramp now marked for US 46 EB and the Garden State Pkwy. used to take all NJ 20 traffic to all directions until the flyover of the interchange was rebuilt to allow SB 20-WB US 46 and EB 46-NB 20 to happen uninterrupted. Since I-80 is just north of here, these are useful movements to have, especially with the completion of NJ 21 a half mile to the south (west in 46 directions). 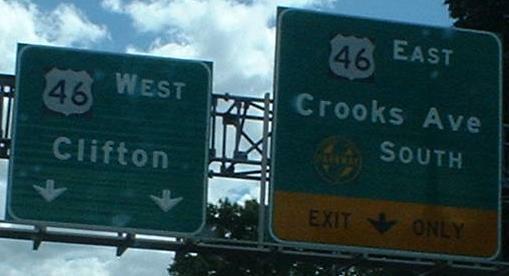 As of August 2004, the bottom of the left panel (the arrows) was clipped off, so it remains to be seen what the sign will look like, although it's not like information has been lost. Two of the first BGS's on NB 20, and a newer use of the separated EXIT ONLY appliqués. The unusual NJ 20/I-80 interchange. Space constraints forced the ramps between a rock (cemetery to the south) and a hard place (Market St. to the north, original US 46). All movements are provided, though some must use a couple of surface streets to cross over I-80. NJ 20 NB is an easy one to follow - ramp to I-80 EB, ramp to Market St. EB, loop over NJ 20 and repeat for WB. NJ 20 is a tough one. The ramps to I-80 are easy enough, but to get to Market St. EB you have to go WB and U-turn across 80 to the combined ramps on the south side. I-80 EB is another easy one to follow - in fact, you can get all the way around to Market St. WB because it merges with the 20 NB ramp. I-80 WB is a nightmare, though. The only ramp at Exit 60 just takes you to NJ 20 NB. The ramp toward the left of this photo is really Exit 59 for Market St. All traffic to Market St. EB and NJ 20 SB has to use the U-turn to the combined ramps. That's the greatest deficiency of the interchange, but with other close interchanges or other constraints on all four sides, it's not improving anytime soon. It's hard to find a location to take a side view of the old Market St. (original US 46) bridge, so here's my best effort. Two views of the beginning of NJ 4, which is just a boulevard for the next couple of miles to the east, but gets some bite as a Jersey freeway once NJ 208 merges with it. The SB BGS, with a cracked shield and button copy, is infinitely more interesting than the plebeian NB LGS. This is an LGS taking over for a BGS - the clue is that old LGS's didn't have button copy, and had a lighter, bluer shade of green than BGS's. There's also an old or at least dirty LANE FOR LEFT TURN ONLY sign on the bridge pier, since replaced. 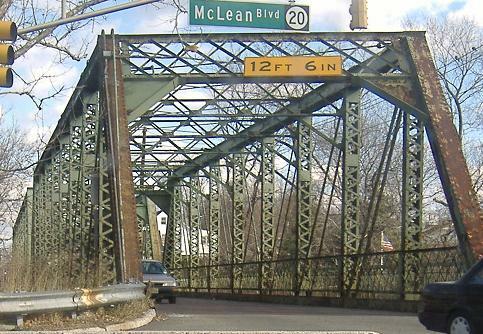 Fair Lawn Avenue crosses a truss much older than the NJ 20 highway.